Each box contains a 2-card sketch puzzle, featuring at least 2 different characters (Spider-Man Vs. Green Goblin, Hulk Vs. Thing, Captain America Vs. Red Skull, Thor Vs. Loki, etc.). Artists include Pablo Marcos, Anthony Tan, Andy Price, Cezar Razek, Charles Hall, Matias Streb, and many more. 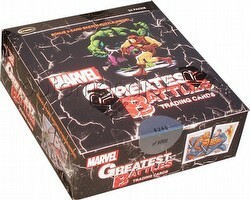 The base set includes 90 cards featuring the greatest battles waged by Marvel's mightiest heroes. Case incentives includes a 6-case incentive - 2-card sketch puzzle by Meghan Hetrick, a 9-case incentive - 4-card sketch puzzle by Warren Martineck, and an 18-case incentive - Greatest Battles Archive box.